I had an idea for a character on the way to see Stallone’s new shoot ’em up, Bullet to the Head. It was for a character that was simpler than other characters and stories I’ve been developing. It was an insect based character, I just love those. Anyway the character’s theme is based on roaches, filthy disgusting roaches. He’s a pest to the criminal underworld. The idea here is to do one page stories akin to the old Hostess snack ads from the 70s and 80s. The comics would feature a villain of the week an we catch the action just as it’s about to get resolved. For the first issue I have the hero fighting a squid themed villain, Carl O’Marley, PHD. The Roach is trapped and has to find a way to escape. That’s all I thought about going in before laying out the action in a thumbnail. 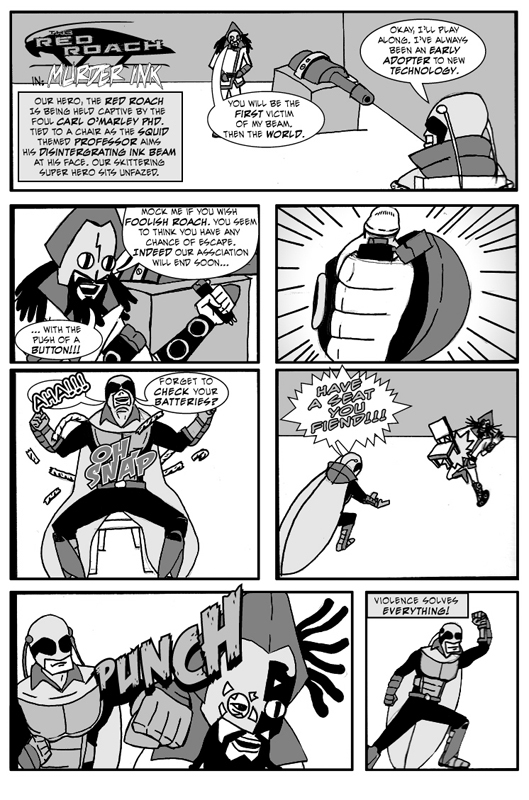 After I lay out he basic action I drew it, inked it, then in the Marvel Way added the dialog. And there we have the first installment below. 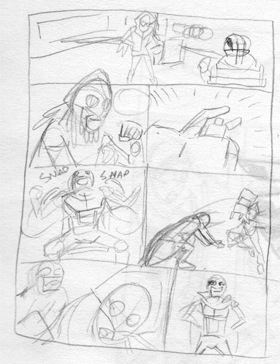 The following images show the thought process for framing the second installment of The Red Roach. As in the case of the first strip, I just thought of a basic situation and laid out some interesting ideas for images based on the characters I wanted to use. This time I used the Pigeon as the antagonist. She’s just your basic winged flyer, bust so is the Red Roach. 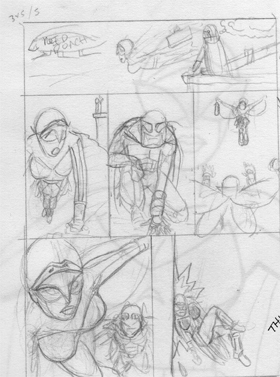 Again I start with the basic idea of them flying and I have to find a way to resolve it in a few panels. I decided I’d rather not have him hit a woman, so she had to crash into a wall. 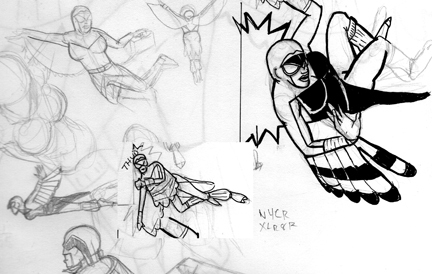 Here are few flight and collision studies for the Pigeon. Below is the finished product for the second installment. You can go ahead and follow the Red Roach and his continuing adventures here at theredroach.wordpress.com.